This sequence of composite images shows a coronal mass ejection with an accompanying prominence eruption over the northwest limb of the sun. 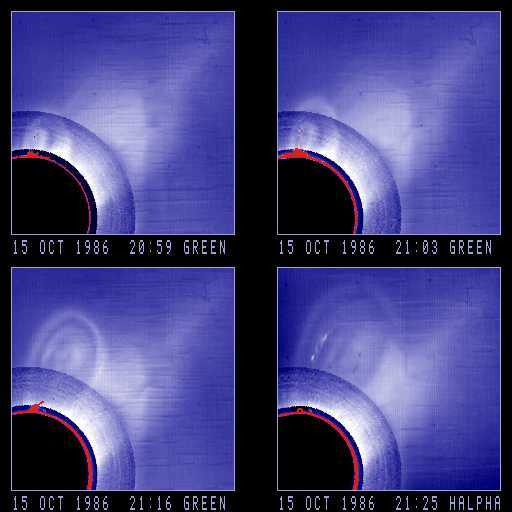 The outer coronal images were recorded by the SMM Coronagraph; the inner coronal images were taken by the K-Coronameter at Mauna Loa. The prominence eruption was recorded by the Mauna Loa Prominence Monitor in the neutral emission line of Hydrogen known as H-Alpha (seen in red). The last frame at 21:25 shows the outer corona in halpha as recorded by SMM. Note the enhanced emission of halpha on the northern leg of the inner loop indicating the presence of neutral hydrogen high in the corona. Solar north is toward the upper left in each image. Loop/cavity with multiple, interior , structured (prominence) loops just north of streamer. Knots on inner loop are visible in Halpha filter. Event moves non-radially (equatorward). Large deflections of streamer. Data is partially streaked.